MSI Time-Domain-Reflectometry (TDR) Structural-Health Monitoring probes the structural health of a composite part by propagating a fast electrical pulse along a distributed linear sensor which has been fabricated directly in the laminate. The sensor is formed from the native graphite fibers already used in composite manufacture, and constitutes zero defect. Fibers are patterned into a microwave waveguide geometry, or transmission line, and interrogated by a rapid pulse as shown below. Structural faults along the line cause distortions in waveguide geometry, producing reflected pulses similar to radar. Cracking, delamination, disbonds, moisture penetration, marcelling, and strain are all detected by propagation delay, for sensor lengths up to several meters. 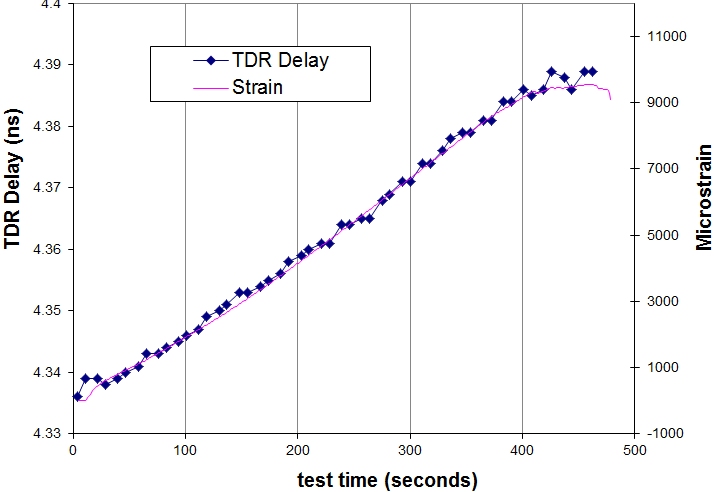 The figure below shows TDR monitoring an advancing bondline fracture in a glass/epoxy test coupon. [1,2]The signal is injected into a graphite sensor straddling the bondline on the left, with mechanical shear applied to the coupon on the right. Initially the signal propagates along the entire 250 mm sensor length, with signal injection on the left and reflection from the far end on the right. As mechanical loading is applied, the bondline separates pulling the sensor apart and producing a rise in reflected signal. The position at which this initial rise occurs indicates the location of the advancing fracture, and moves to the left as the fracture propagates. Differences in position as small as 5 mm are resolved, as shown in the figure. The figure below shows a sensor detecting linear strain in a similar glass/epoxy coupon. 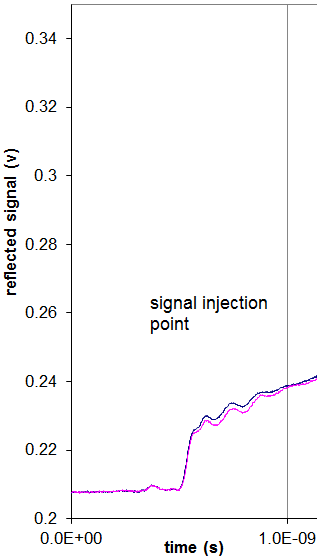 The signal is injected into a graphite sensor running along the axis of the coupon, and longitudinal tensile stress applied. 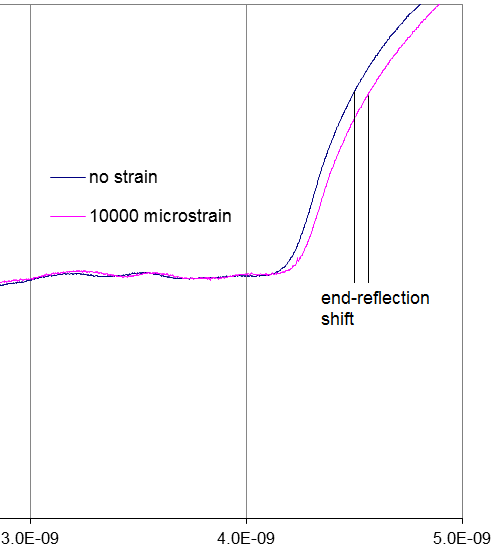 For linear stress up to 600 MPa a change in end-reflection is clearly visible, with the reflection arrival increasing to longer delays with increasing strain. The variation in delay time is plotted as a function of measurement time in the figure below, and shows an excellent correlation with strain-gauge reading. The above describes some specific examples of our TDR Structural Health Monitoring System and its application. Some general features, advantages, and benefits of the system are listed below. Intrinsic sensing. Uses graphite paths already present as the sensor. Low invasiveness and cost. Distributed sensing. Separates defects according to position. More detail of structural damage. Multifunctional Detection. Versatile detection of cracking, disbonding, delamination, strain, moisture penetration, marcelling. Adapts to different geometry and damage configurations. Multifunctional Monitoring. Provides cure monitoring during processing. Useful during both processing and service. Inductive Sensor Coupling Non-contact sensor coupling. Minimizes sensor Ingress/Egress. Portable electronics package. Provides small portable unit with LCD or PC display. Portable and robust electronics suitable for field use. Monitors multiple sensors simultaneously. This Small Business Innovation Research (SBIR) Phase I project will develop a novel method of interrogating the structural condition and cure state of composite materials. It works by propagating a sub-nanosecond voltage pulse along an intrinsic microwave transmission-line fabricated directly in the laminate. The transmission-line is formed using graphite-reinforcing fibers as the conducting path. 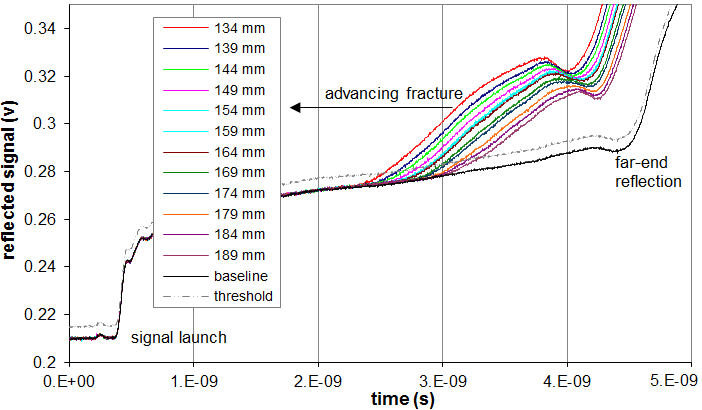 Changes in pulse propagation are used to monitor changes in cure state, and detect various structural failures such as microcracking, delamination, disbonding, marcelling, and moisture absorption. The fibers are native to the material and constitute zero structural defect, and negligible cost. Applications include graphite composites, glass composites, composite joints, and metal-adhesive joints. The commercial potential will be an inexpensive and spatially continuous structural-health and cure monitoring system with minimal invasiveness. A. Abu Obaid, S. Yarlagadda, M. K. Yoon, N. E. Hager III, R. C. Domszy "A Time-domain Reflectometry Method for Automated Measurement of Crack Propagation in Composites during Mode I DCB Testing" Journal of Composite Materials, 40, p 2047-2066 (November 1, 2006) msi_dcb_jcm_2006.pdf. S. Yarlagadda, A. Abu Obaid, M. K. Yoon, University of Delaware; N. Hager, R. Domszy "An Automated Technique for Measuring Crack Propagation during Mode I DCB Testing", Society of Experimental Mechanics, X International Congress, Hilton Costa Mesa, 2004 June 7-10.